A bunch of newspapers are reporting that there have been about 80 cases of norovirus aboard Queen Victoria's second cruise. As we've discussed in the past, that's silly enough. They don't report it when a number of people at a local school or manufacturing plant infect each other with cases of flu - or norovirus - so why do they do it when it's on a cruise ship, especially in this case where the percentages are so small? But that's another story. In this case what's really silly is that some of newspapers - especially in the UK - seem to be trying to create a link in readers' minds to the "bad luck" that superstitiously goes along with the bottle not breaking on the first try when the the Duchess of Cornwall named the ship a couple of weeks ago. You can check examples in The Times, The Guardian, The Telegraph, This is London (calling it "the curse of Camilla), and as far away as in Australia's The Age. Much of their coverage of the ship's entry into service earlier this month centered on that bottle not breaking. Sure it's an interesting sidelight, but it's certainly not unique. It's not worthy of being the headline or the focus of the story, especially compared to the real story of the size of Carnival's investment in the British cruise industry and the number of additional berths Cunard will have. Granted, the Duchess of Cornwall is not one of the more popular Royals in the UK, but three weeks ago she pushed a button and a piece of glass doesn't break on queue, and now trying to link that event to people getting norovirus this week is just silly. Every time a passenger has a bit of bad luck aboard the ship, such as losing in the casino, will these papers attribute that to the Duchess, too? Leave the woman alone. Last Monday, I was fortunate to be invited by Cunard to attend the naming ceremony for Queen Victoria. I'm sure you've read accounts of the ceremony itself. It was stupendous. Cunard spent gobs of money on the event - even building an auditorium for it on the pier. They brought forty-some journalists from the US to cover it. They were primarily from publications (print or web-based) that cover the cruise industry. There wasn't a chance to spend a cent out of your own pocket during the two-day stay. Cunard asked nothing of us, other than the implied expectation that we would actually run articles about the ship. There was one thing they asked. On the itinerary we received before we left home, and again on the updated one we received in Southampton, it said that photography and video recording was not allowed during the ceremony. 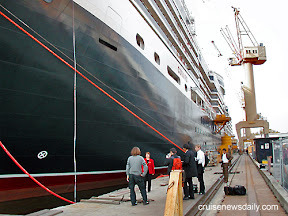 Again at the beginning of the event, they made the announcement that Cunard respectfully requests that there be no photography or video recording during the ceremony. I have to admit I was tempted to sneak a couple photos, but then wondered, "Why should I?" Cunard had professional videographers recording the event from several angles, and they had a bevy of professional photographers positioned in a press area, who had been briefed on when they could move and where they could go to get the best shots. Nothing any of us would take could in any way be considered exclusive, and certainly wouldn't be of the quality coming from the super-expensive equipment of the pros. And our angles wouldn't be anywhere nearly as good as the shots from the photographers who would be positioned at the edge of the stage at the time when the Duchess actually named the ship. Cunard promised us electronic versions of some of the still photos and clips of the video would be available to us within minutes of the end of the event. More photos would be available later, and a recording of the complete ceremony would be issued later. Knowing how this works, there would probably be hundreds of other photos available if you have some specific need. So why would anyone want to take their own pictures? Refraining from taking pictures is the only thing our host had asked of us. Sure there was a chance that the Duchess of Cornwall would step off the stage and fall in the orchestra pit, or that Prince Charles' pants would fall down. I'm sure pictures of that wouldn't be made available, but chances of either of those photo ops seemed astronomically slim. So like most of my colleagues, I just sat back and enjoyed a magnificent event. When I returned to the ship, I wrote about the event for CND, and as promised, photos were already available to us, and I used one with the story. When I returned home, I was surprised that so many of my colleagues from other publications had their own photos on their websites. None of them were from good camera angles. Most of them were poor-quality photos besides. At least one person took crappy-quality video clips and posted them. The point of all this is that if they can't refrain from breaking the rules here, it indicates a lack of integrity. To me it also speaks to their credibility. In the future, whenever I read anything written by those people who have the "illegal" photos or video on their websites, I'm going to wonder what other ethics they've ignored. Have they plagiarized? Have they made up "facts" or "quotes?" Or is this the time they are operating within the rules of journalistic ethics? Istithmar World has appointed Manfred Ursprunger chief executive of its QE2 venture. The company will operate QE2 as a hotel and entertainment destination in Dubai beginning in 2009. The company takes delivery of the ship from Cunard in November 2008. 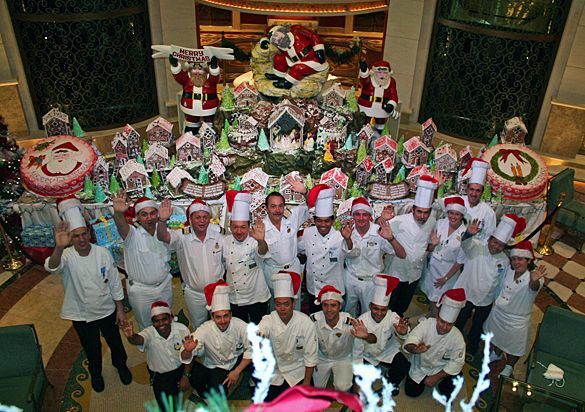 Ursprunger has almost 30 years experience in the cruise and hospitality industry. He has held senior positions with Norwegian Cruise Line, NCL America, Silversea Cruises, Holland America Line, Costa Crociere, Celebrity Cruises and Renaissance Cruises. Cunard reports Queen Victoria will be handed over to them tomorrow at Fincantieri's yard in Marghera. The ship won't sail for Southampton until November 30, however. While in most ships' cases, the actual handover is a low-key business transaction, much like closing on a house, Cunard is planning to make the handover into a major event that will include the Italian Prime Minister, the British Under Secretary of State, and the band of the Scots Guards, flown in for the occasion. The ship will arrive in Southampton at 9:30am on December 7. It will be named there on December 10 and depart on its maiden voyage at 5pm on December 11. The M/V Explorer is sinking in the Antarctic off the South Shetland Islands after the ship reportedly struck something underwater. Reports say all 100 passengers and 50 of the 52 crew members were evacuated into lifeboats and are being picked up by other ships arriving on the scene. The captain and first officer have remained onboard for the time being, and at last report, the ship was listing at 25 degrees. A spokesperson for the tour operator which had chartered the ship, said the 2,400-ton ship had struck ice off King George Island and it had opened a gash in the hull several inches wide. She said that pumps were being used in an effort to stop the sinking, but a Coast Guard spokesperson said the ship is expected to sink. Officials were first advised at 12:24am, eastern standard time in the US. The 1969-built is owned by Toronto-based GAP Adventures. UPDATE 8pm: Reports are now quoting a Chilean navy spokesperson as saying the ship has completely sunk. All passengers and crew members had been safely evacuated and rescued before the sinking. Princess Cruises announced today that when Dawn Princess goes to Australia in the fall of 2008, it would not be returning to North America as originally scheduled. It will remain in Australia indefinitely to continue the line's expansion there. Earlier this year, Princess announced a major expansion "down under" when they said Sun Princess would remain there to service the locally-sourced market with a product tailored for the Australian market. Like Sun Princess, Dawn Princess will still be available for sale worldwide. Together Sun and Dawn Princess in their new market will offer some interesting itinerary choices not available before for customers in North America, including a lengthy season on Australia's west coast. A woman passenger was reported missing from Discovery Sun, a 9,900-ton casino ship/ferry that operates between Ft. Lauderdale (Port Everglades) and Freeport. She was last seen by her companion Sunday evening about 9:30pm. She was reported missing about 10:30pm. The Coast Guard is searching. Update 5pm: The woman's body washed up on a Hollywood beach today. The county medical examiner has ruled her death a suicide. It seems like the deck was stacked against Norwegian Majesty this weekend. The ship's return from Bermuda to Charleston was first delayed when the ship rescued a sailboater. Then the ship ran into heavy weather which slowed its speed. As a result turnaround in Charleston was delayed from Saturday to Sunday. The result is that Saturday's sailing (November 17) will depart on Sunday and be shortened to six nights. The revised itinerary will call at Nassau, Great Stirrup Cay (NCL's private island) and Key West. The legal obstacles have been removed (at least temporarily), and the Hawaii Superferry has finally been able to set a new launch date of December 1 for the start of their service between Oahu and Maui. The line is offering an introductory fare of $29 per person, each way. Service between Oahu and Kauai, part of the original plan, will start at a later date. More information is available on the line's website. In a very succinct writing may I just say that there are many ways to play the game. If the cruise lines want to take away my on-board money with a surcharge, I just take away money that I would have spent somewhere else. There is plenty of good food to be had in a variety of venues so I will simply choose not to dine at one of the specialty restaurant's a couple of times per cruise. Other people will cut back on cabin attendant's gratuities. People really aren't dumb! I believe that the fuel supplements are justified. This isn't just a way for cruise lines to extract more money from the passengers. Just watching the price of crude oil or a trip to the gas pump proves it. Costs of everything are going up because of the price of fuel, not only goods and services where fuel is a major component, such as cruises, but even any product that has to be transported to the seller, and retailers are routinely passing those increased costs on to the consumer. It doesn't make sense that cruise lines wouldn't. Naturally everyone has to stay within their vacation budget. Those who are going to recoup the fuel supplement by reducing the cabin steward's gratuity are grossly unfair. The cabin steward had nothing to do with the price of fuel or the fuel supplement, so I see no reason to punish him, because he didn't reduce his service to the passenger. Reducing your other onboard spending would be a valid way to contain your cost, but in the end, I think you'd really only end up punishing yourself. When I was a travel agent, occasionally I'd have people who would be on such a tight vacation budget that after buying the minimum accommodations on the ship, they really wouldn't have much money left to spend on the trip. I sometimes had people ask me to help them select one shore excursion because they could only afford one for their entire trip. Once I remember a couple telling me that to stay within their budget they were limiting themselves to only ordering one bar drink per day. Those were the type of people I'd try to talk out of going on the cruise. I'd suggest to them delaying the trip a year and saving a little more so they could go and spend whatever they wanted. In my opinion, they would have a much better time going once and having the freedom of being able to do whatever they wanted rather than going twice and having to be careful about every cent they spent. In the case of the fuel supplements, on most lines, for a week's cruise it's going to cost passengers between $35 and $50 (or $70 to $100 per couple). Whatever the reason for the increase, I believe that if your vacation budget doesn't have that much flexibility in it, like the people who can only afford one drink per day, you'd be better off cancelling the cruise and rescheduling a bit later when you've saved enough that you're not going to have to restrict things you might really want to do during the cruise, such as the specialty restaurant, as you suggest. I suspect you really have that $100 worth of flexibility in your budget, and it's really just a matter of principle. In this case, my principles wouldn't tell me to punish myself along with the cruise line. Royal Caribbean has announced a fuel supplement for all sailings beginning February 1, 2008. The surcharge, which applies only to the first and second passengers in the cabin, will be $5 per person per day, with a maximum of $70 per person. Any passenger currently booked who does not wish to pay the surcharge may cancel by December 7 without penalty. Windjammer Cruises has canceled three more weeks worth of cruises. Worse yet, Windjammer is being very hazy about when those people will get refunds. We understand there are also still lots of people waiting for refunds from canceled sailings even farther back. Windjammer is now also even unwilling to refund any charges for changing air fare for those who were on the canceled cruises. 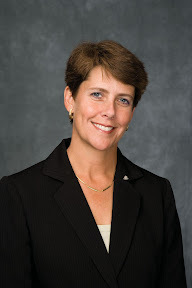 In preparing today's edition of Cruise News Daily, we spoke with Sandi Copes of the Attorney General's office in Florida. She told CND that they have been contacted by 34 people regarding Windjammer. That doesn't necessarily mean 34 official complaints have been filed with them, but it is at least one step in the process. Depending on their circumstance, the individuals may go on to file full complaints. She said that right now their office is conducting an internal review of the situation. She said that is a preliminary step to deciding whether or not to take some action against Windjammer. Copes encouraged all consumers having a problem with Windjammer (even if they are not in Florida) to either call the Attorney General's office or register the information on their website. She said that helps them see if there is a trend, and it assists their office in deciding a course of action. They'd like to hear from anyone who feels Windjammer hasn't dealt with them fairly, including people who have not been refunded money for canceled cruises, people who have had to resort to getting a chargeback on their credit cards, and people who are owed money for air fare to meet up with canceled cruises (especially those who may have gotten to the port before they found out the cruise was canceled). Inside Florida, the number to call is 866-966-7226. Outside Florida, the number is 850-414-3990. The Attorney General also has an online complaint form. Norwegian Cruise Line has become the second of the major cruise companies to add a fuel supplement. The first and second passengers in the cabin will pay $7 per person per day, and any additional passengers will pay $3 per person per day. Unlike the Carnival program, there is no maximum charge per voyage. The supplement will apply to all new bookings from December 1, 2007 and beyond. Coast Guard spokesperson Jennifer Johnson tells CND that they are continuing to search the waters north of Hollywood Beach (Florida) for the crew member missing from Sea Escape's Island Adventure. In addition to the HH-65 Dolphin helicopter that mounted the search yesterday, a Falcon jet joined the search today. Late yesterday, a cutter and one of the Guard's smaller vessels also were on the scene assisting in the search, and they also were searching today. At the time he may have gone overboard, the currents were going toward shore. They still remain optimistic that the man will be found. A crew member was reported missing this morning from Sea Escape's Island Adventure. The man is believed to have gone overboard during last night's cruise to nowhere out of Ft. Lauderdale. The Coast Guard is searching an area due east of Hollywood (Florida) and north and toward the shore where the current models show he would likely be. The 44-year-old man was last seen about 9:30pm during the evening cruise, which returned to Port Everglades at 12:15am this morning. Records show he did not disembark from the ship. 8:30 when he didn't report for work. After thorough searches of the vessel, he was reported as missing to the Coast Guard about noon. The Charleston (SC) Post & Courier reports that Norwegian Cruise Line is increasing its turnarounds at the city this year to a record 36 NCL cruises departing Charleston this year. The agreement between the state, which operates the port, and the cruise line guarantees the port 105,000 passengers will board NCL ships at this winter season, on nine more sailings than last year over the same period. The article says last year the port's passengers numbered 107,030 for all cruise lines combined. In addition to the NCL sailings from Charleston, five other lines have scheduled port calls there. Of course while the additional ships are bringing additional revenue to the port and providing economic benefit to the area, there is an element of the local population, as reported in the article, which is concerned about the effects of the additional visitors on the city. Read all about it in the link to the Post & Courier article. Norwegian Crown wrapped up it's Bermuda season for Norwegian Cruise Line and has been handed over to Fred Olsen for conversion to Balmoral. Fred Olsen has actually owned the ship since last year, but a condition of the sale was that NCL could lease it back through the 2007 Bermuda season. Carnival's brands marketing in North America will add a fuel surcharge to their prices for passengers departing on February 1, 2008 and after. The surcharge will be $5 per person per day for each of the first two passengers in the cabin, capped at $70 per person for the voyage. Additional passengers in the cabin will not be charged. The brands affected by today's action are Carnival, Costa, Cunard, Holland America, Princess and Seabourn. A surcharge was previously added to the company's European brands. According to Fairplay, Cuba says they have lost $17 million worth of cruise business since Royal Caribbean purchased Pullmantur and could no longer do business with the island nation. That includes termination of all Pullmantur's ship's calls on the island's ports and no longer employing Cubans to work on the ships. The Palm Beach Post reports of the death of a cruise ship passenger while ashore. This gentleman rented a motor scooter while ashore in Nassau. Like so many others who die tragically, he may have forgotten he was doing something he wasn't used to. The activities look easy because, as in this case, we all drive, but that can lull us into a false sense of security. People tend to forget there is actually an extra element of danger involved. That's compounded by the fact that you aren't really used to doing the activity in this particular way. In this case, this man probably wasn't used to driving a motor scooter, and since he was a Florida resident, he wasn't used to driving on the left side and having the controls reversed. If there is some good that can be brought out of tragic incidents such as these, it is that they should serve to remind the rest of us that there is an element of danger to many of the activities available ashore. Whether it be parasailing, snorkeling, driving a motorboat or even just driving a motor scooter, they may look easy, but we shouldn't forget to add an extra big element of caution while we're having fun. We just have to remember that we aren't invincible. Silversea Cruises announced that Rocco Auteri will become its SVP of Fleet Operations effective immediately. He will be based in the company's Monaco office. Auteri comes to his new position with previous experience. 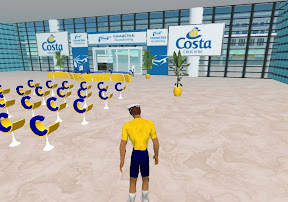 Most recently he was Costa's director of operations for Asia. Prior to that he managed their hotel operations division which he came to after a ten-year career as a shipboard hotel director for the Italian line. At the same time, the line announced Erling Frydenberg will transition from the role of COO, which he has held for four years, to work as a consultant on special assignments for Silversea. As a project toward earning his Eagle Scout rank in the Boy Scouts, 14-year-old Alex Border of Miami wanted to provide football (soccer) uniforms to other kids who couldn't afford them. What he was originally thinking about was used ones, solicited from area teams. As the drive grew, he found what was being donated was not used uniforms but surplus ones that had never been worn. He eventually ended up with about $6,000 worth of the clothing. Of course Alex needed to find somewhere to donate the equipment, and he realized there were lots of teams in need in the Caribbean, so that's where Alex's dad came in. He works for Carnival, and asked them to use their contacts in the Caribbean to find teams that could use the uniforms. Not only did they find the teams, but they also transported the boxes there on their ships. Above, you see Alex and his dad delivering the boxes to Carnival's headquarters in Miami. In the lower photo you see the uniforms being dropped off by Carnival Destiny during a regular port call at the island. 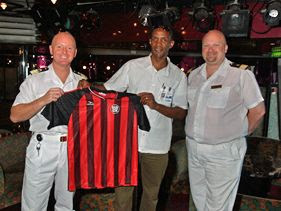 Shown here are (from left): Carnival Destiny Hotel Director Andy Brown; Dominica Football Association President Dexter Francis; and Carnival Destiny Chief Purser Marcus Davies. Carnival Cruise Lines has appointed Justin French director of sales and marketing for Canada. French joined the company in 2003 as a business development manager for western Ontario, and last year was named Carnival's "Canadian Region Salesperson of the Year." French will remain based in Georgetown, Ontario and be responsible for directing the efforts of the line's five Canadian business development managers. Did you catch the somewhat uneven review of writer Jason Cochran's cruise to Bermuda aboard Azamara Journey in the New York Post? It starts off favorably enough, but the farther you read the less happy he seems to be with the experience. To sum it up, he seems to like the hardware and the concept, but is anything but impressed with the onboard product. Part of the problem may be that Mr. Cochran is confused about where Royal Caribbean is positioning the Azamara brand. (Maybe Royal Caribbean itself is sending mixed signals, or at least unclear ones to those who don't know much about the travel industry.) At one point he says that the rates of $1,500 to $2,500 for a 14-night cruise are "sane." Those certainly aren't luxury prices by any stretch of the imagination. ($175/night at the top end of the range for luxury?) When, in another place, he says, "When I spend this much for a cruise...." he starts to lose credibility with me for knowing about luxury cruising. (Seabourn Odyssey will debut with minimum accommodations starting at $645/night.) Then he chides Azamara by saying, "Let's not pretend that you're a true luxury brand." I'm not sure who is pretending and who is confused. If Mr. Cochran had just stuck to talking about the things he liked and didn't like about the product, it would have been an excellent and credible review. Bo-Erik Blomqvist will replace the retiring Ian Gaunt heading up Carnival Corp's shipbuilding operations. Blomqvist will become SVP corporate shipbuilding for Carnival Corp effective February 1, 2008, based in Southampton. He will report to Carnival chairman & CEO Micky Arison and vice-chairman and COO Howard Frank. He has been deputy vice-president, cruises & ferries for Aker Yards, with his most recent assignment in France where he was responsible for the integration of Chantiers de l'Atlantique into the Aker Yards group. Prior to that he held several positions with Aker and before that with Kvaerner-Masa Yards for 14 years. Of the retiring Gaunt, retiring after nearly 30 years with Carnival, Frank said, "Ian's contributions to Carnival Corporation & plc are immeasurable, as he's played a critical role in the continued growth of our company overseeing the construction of some of the most beautiful and technically advanced ships in the cruise industry." Gaunt will remain with Carnival as their outside legal counsel for shipbuilding contracts. The change comes at a key time when the company has 20 ships are order for delivery between this December and June 2012. Carnival currently operates 84 ships with 156,000 lower berths. The interior construction of Cunard's Queen Victoria is moving forward quite rapidly at the Fincantieri shipyard in Italy. These photos show the nearly-complete library. Valencia, CA - October 4, 2007 - With just over eight weeks remaining before Cunard’s Queen Victoria makes her December 10 debut in Southampton, England, the ship’s distinctive public spaces continue to evolve, showcasing the elegant design and signature features for which the 168-year old ocean liner company is known. 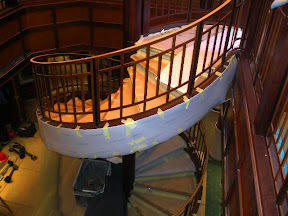 Without exception will be the new Cunarder’s two-storey library, distinguished by a spiral staircase and rich wood paneling, providing a tranquil and stimulating respite for the line’s literary-minded guests. Situated on Deck Two and Three, the multi-language library will feature more than 6,000 volumes, a broad selection of newspapers, periodicals and reference materials. 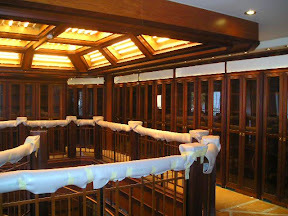 Yet to be completed is the wooden coffered backlit ceiling highlighted by dramatic leaded glass with elegant geometrical and classical patterns, creating a rich contrast between the room's golden, green, and cream tones and the mahogany wooden cabinetry below. The inclusion of a shipboard library is a longtime Cunard tradition, as the company was the first to install such a venue on the Bothnia in 1874. Queen Victoria’s library will be the second-largest at sea, next to the library aboard her sister ship, Queen Mary 2. Stay tuned for more updates on Queen Victoria’s progress. AFP reports that the crew of the Bahamian-flagged ship Dream has been stranded in the Greek port of Rhodes for more than two weeks. Authorities in Rhodes have prohibited the ship from sailing because it is listing at about 10 degrees. Upon inspection, they found waste tanks had overflowed causing the imbalance, and other things in a state of disrepair. The ship's 930 Israeli passengers were flown home. It is expected to take at least another week for repairs before the ship will be allowed to leave Rhodes. Official word about anything from Windjammer Barefoot Cruises seem nonexistent, but as anyone following the story knows, there are clear signs of trouble. But there is official word from the investor who at one time appeared to be their rescuer: The deal is off. Not only that, but now he's in the group of people filing suit against the line. An article in the Miami Herald today, spells it all out. Basically the Herald article says that Jerry Ceder claims he broke off negotiations with Windjammer when he found they were also in negotiations with another investor, despite the contract with him that prohibited them from doing that. Not only that but TAG Virgin Islands which was believed to be part of the financial rescue, now tells the Herald that they were never involved. Ceder's lawsuit claims he advanced Windjammer $373,000 during the negotiations to pay expenses and keep the ships from being arrested. He then says he became aware of Windjammer soliciting other investors. He wants his money back in addition to unspecified damages. More trouble for the troubled line. For Americans it's a Christmas tradition watching Ralphie get his tongue frozen to a flagpole and beg his parents for a Red Ryder BB gun. For Italians it's going to "the Christmas blockbuster," which might be a new film each year but with a familiar story. This year's film will have a brand new "star," however, Costa Serena. The films are a series by Aurelio and Luigi De Laurentiss that have basically the same plot, same stars, same jokes but a new and most fashionable setting each year, and the films are released at Christmas each year. (Americans will know the De Laurentiss' daughter, Giada De Laurentiss, from her show on the Food Network and as a part-time host on the Today show.) This year the setting for "Natale in Crociera" ("Christmas on a Cruise") will be aboard Costa Cruise Lines' new Costa Serena. The 114,500-ton ship is Costa's newest and was just delivered by Fincantieri in May, and we're told the ship actually figures into the plot of this year's story. Filming has begun (some of it on the ship), and the company has set up a blog with production updates at http://blog.nataleincrociera.it/, although it is only in Italian. (Google can provide a rough translation, but you're on your own for the YouTube clips.) Apparently in Italy, films can be produced much faster than in America, because it set to be released already on December 14, 2007. If you want to catch Natale in Crociera over the Christmas holidays, you will have to make a quick trip to Italy; the films are only released in Italy and Switzerland. The series of comedies has been going on for 30 years, and not only are they a tradition, but they are profitable. They often come out to be the top box office draws of the year in Italy, and in 2005, for example, Natale a Miami (Christmas in Miami) outgrossed King Kong and Harry Potter. Other recent films in the series include Natale sul Nilo (2002, Christmas on the Nile), Natale in India (2003, Christmas in India), Christmas in Love (2004) and Natale a New York (2006, Christmas in New York), which was the highest grossing ever. Before you snicker, just remember, we in America don't seem to be able to stop looking at Britney Spears. Last month ago we last told you about The Scholar Ship, a floating university program partially backed financially by Royal Caribbean Cruises that is sailing around the world aboard the former Sea Princess. (link to original blog entry). Carnival Cruise Lines has hired Ruben Rodriguez as their new executive vice president of marketing and guest experience. In that capacity Rodriguez will have overall responsibility for marketing, public relations, guest experience and product development. He will report to Carnival president and CEO Gerry Cahill. Rodriguez, 44, is currently a partner and managing director in the Miami office of Boston Consulting Group (BCG), a global strategy and management consulting firm. Carnival is a customer of BCG. Rodriguez will join Carnival on October 29. First steel is cut for Norwegian Cruise Line's first F3-class ship at Aker Yards. We told you that Norwegian Cruise Line had wrapped up the Jewel-class project with Meyer Werft when Norwegian Gem was delivered yesterday. NCL had another big event in another part of Europe yesterday, although not as dramatic, that looks to the line's future. The first steel was cut for NCL's first F3 ship being built by Aker France at their St. Nazaire yard. Along with the event came some interesting information about the two-ship order. Disney customers can win an opportunity to have the line's private island, Castaway Cay, all to themselves. For many cruise passengers, a day on the cruise line's private island is the highlight of the trip. But when you share it with a couple thousand other passengers, is it really "private?" For a couple lucky Disney guests, their visit to Castaway Cay will be really private. There's an interesting tidbit in an Orlando Sentinel article today about Disney Cruise Line's ongoing negotiations with Port Canaveral for extension of their contract there. The article says that this summer for the first time in history, Disney had to make a payment to the port, as required under their current contract, because their ships did not meet the required number of calls at Port Canaveral. Disney made just 139 of the required 150 calls at the port during the contract year that ended in July. The shortfall was due to Disney Magic operating a series of Mediterranean cruises this summer, so it was no surprise to Disney. The payment required under the contract for the shortfall was $107,000, according to the Sentinel. The article is about Disney's future at Port Canaveral and the new contract they are negotiating as their initial ten-year agreement comes to an end. Although Disney has two additional ships on order now, their building has not kept pace with the rest of the American cruise industry. The Orlando Sentinel article seems to imply that there is some surprise that Disney is not necessarily in planning on always having all their ships based at Port Canaveral, although Disney has traditionally had both of their current ships homeported there. It shouldn't come as any surprise to the Central Florida market that Disney is planning to homeport ships elsewhere. While there is a growing market there, only having ships sailing from Port Canaveral is one of the factors which has limited Disney's growth. The last two summers, Disney has already sent Disney Magic to other parts of the country/world to sail series of cruises from other ports, and they have announced plans to do so on future dates. No major cruise line has all their ships homeported at only one port, and even in Disney's early days, as they talked about adding three or four more ships, they envisioned putting them in different ports around the country, including near Disneyland in Southern California. This shouldn't come as a surprise to the people in Central Florida. They should rest assured, however, that there's little chance Disney will ever leave Port Canaveral entirely, because so many of their passengers' vacations are connected with a Disney World visit, either directly or indirectly. Meyer Werft delivered Norwegian Gem to Norwegian Cruise Line this morning at Eemshaven, where it has been since completing sea trials. Norwegian Gem is the fourth of four ships of the series on order from the German builder. Carnival Cruise Lines has just published the second (and expanded) edition of the "Carnival Towel Creations" book. Found: A good gift for the person who has everything or needs nothing, but you have to bring something home for them that says "cruise," doesn't cost much and isn't tacky. Carnival Cruise Lines has just published the second (and expanded) edition of the "Carnival Towel Creations" book. Towel animals have long been a favorite thing for passengers to come home to each night of their cruise, so what would make a better souvenir of the trip (other than the cabin steward himself) than a book that details how to make all the ones you saw and 70 more? Crystal Cruises has changed their commission structure to discourage agents from stealing other agents' business by undercutting pricing. Cruise lines aren't excited that travel agents discount their product. They want a knowledgeable and professional sales force selling their product, not ones cutting their profit to the minimum and hiring inexperienced sales people who don't stay very long. To that end, they don't want travel agents giving up significant portions of their commission just to compete with each other on price. As we've reported in the past, several cruise lines have come out with policies meant to discourage agents from rebating and advertising discounted rates, but last Friday, Crystal came out with a unique policy to address their situation. The discounting and rebating came to the luxury end of the market relatively late. What Crystal has noticed lately is a growing number of customers requesting to switch their bookings to a different travel agent after they are under deposit. As they have looked into this phenomenon, what they've found is a growing number of travel agents soliciting other agents' booked customers by offering to surpass whatever discount, onboard credit or other incentive the other agent is offering if the passenger will transfer the booking to them. Of course, why not? The first agent has done all the work of finding the client, helping them select the cruise, discussed all the options and has done the booking. The vast majority of the time and expertise necessary for the booking has already been done. On most bookings there is usually a relatively minimal amount of time necessary to finish assisting the client _ usually just processing the final payment and delivering the documents. So why shouldn't the second agent be willing to work for a lot less money. Of course the first agent ends up with nothing for all the time and expertise invested. Crystal came up with a clever solution that should put a stop to the practice, at least if the first agent has gotten as far with the customer as collecting a deposit. Effective January 1, if a customer under deposit wants to switch travel agents, they can still do it, but the new agent's commission will be capped at 10%. The theory is that if the agent isn't making as much money in the first place, they don't have as much to discount/rebate, so the problem should be solved. "We believe this is another step toward curbing rebating activity and we want to protect the original agent who has worked hard to service a client," said Bill Smith, Crystal's SVP of sales & marketing. "Guests are free to choose the agent or agency with whom they work. In the luxury sector, they should be evaluating service and not who is willing to buy them away from another agent because of promises of discounts or rebates." Simply put, the idea is that the customer should shop for his agent first, not after the agent has invested the time with the client. Once the agent has done that, the agent should then be paid for his investment. Previously to curb rebating, Crystal instituted a policy that they will only process credit card payments for the full amount of the booking, not a discounted amount. This article appeared in the October 1, 2007 edition of Cruise News Daily. It was just announced that the US TSA (Transportation Security Administration) will subject airline passengers carrying remote controlled toys (and their remotes) to additional screening at all airports. This is effective immediately. The toys include remote controlled cars and trucks, etc. It's reasonable to believe this procedure will soon be adopted by security at airports in other countries. At this point, it won't affect cruise ships, but of course, a large percentage of cruise passengers fly to their port city. Well-known industry figure Tom Russell has joined Silversea Cruises in the new position of senior vice president of product development. Russell brings his vast expertise to Silversea at a crucial time with Silversea just last week announcing the purchase of the expedition ship World Discoverer. Russell's primary responsibility will be the design, deployment and itinerary development for Silversea's new luxury expeditionary cruise product, although he will also coordinate a variety of major projects and initiatives across departments, according to the company. Russell was previously part of the founding executive team of Silversea in 1992. He had wide-ranging cruise experience with Sitmar, Princess and Costa prior to joining Silversea. After leaving Silversea in 1996, his career centered on the destination-oriented part of the cruise industry in his positions with Cruise West, Society Expeditions, Holland America/Windstar, and most recent, Uniworld Grand River Cruises. Effective October 14, Russell will be based in Silversea's Ft. Lauderdale office. A woman was reported missing from P&O Cruises Oceana this morning while the ship was sailing between Zeebrugge and Southampton. The woman was last seen in her cabin about 5:45am local time. She was reported missing by her husband just before sunrise, and P&O began their standard procedures to search for a missing person which included notifying the Coast Guard. The woman's body was later recovered from the water of the Solent between Calshott and Cowes. While Congress has focused on crimes aboard cruise ships for which they think the cruise line is to blame, there's been a story developing over the last couple of weeks that says you also have to watch out for chance encounters with your fellow passengers. A couple of weeks ago, two men literally bumped into each other on Carnival Elation on the first night of the ship's 5-night cruise from San Diego to Mexico. All accounts have the one man - a businessman from the San Diego area aboard to celebrate his 50th birthday - having had several drinks. The other man was in his early 20's and with a group of people. There was some conversation between the two, and that's where the stories begin to diverge. Some of the stories say they had a little pleasant conversation; some say the exchange was heated. Some say the older man then threatened the younger man. Then reconverge again saying there was a minor scuffle, and the older man fell down a flight of stairs. He was unconscious and bleeding from the head when he landed at the bottom of the flight. The ship stopped at Ensenada so he could be taken to a shoreside medical facility. In line with normal procedures, the FBI was notified and the younger man was detained onboard for questioning. (No criminal charges have been filed.) The original incident was reported by the San Diego Union Tribune. About a week later, there was a follow-up article. The older man's injuries were very serious, and he hasn't regained consciousness. The man's family has already filed a $100 million lawsuit against the younger man. Carnival was not named in the suit. The other interesting thing is comment sections that have developed on that article and one two days later. They both have drawn a huge number of comments, including many from people who were there and witnessed the incident. In true Perry Mason style, the participants are clearly divided into two completely different perspectives, almost like they were at two completely different incidents. This is going to be an interesting story to watch develop for months to come, long after the cruise was over. Needless to say, no matter who ultimately proves to be at fault, we hope for the older man's best recovery.